Voice Over Talent We offer voice over talent for commercials. We also offer public address accouncer services. DJ Services We offer DJ services for parties and receptions. Just need a sound system for your event? We can rent one to you! Contact us for your next event. Web Development We are offer web development using C# .Net, Coldfusion, Joomla, jQuery, HTML5, SQL Server. We build sites from simple to complex. Don't want to deal with the hastle of writing code? Let us do the heavy lifting. 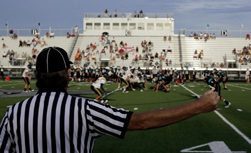 Sports Officiating We offer officiating services for Basketball, Football, Baseball and Softball. We have officials that work all levels of the sports from Little League through Division 1 College. Need sound for an event? Let us run it for you! Need a website? Want to know more about social media? Don't know where to start? Let us help! See what we can do for you! Do not waste your time hosting with companies where you are just a number! Come host your site with us! We offer affordable hosting plans with personal attention. Copyright ITech Consulting Solutions 2019. All rights reserved.